The next stop was the insectarium. The next indoor attraction was the insectarium. I think this big guy is a red-kneed tarantula, a native of Mexico. 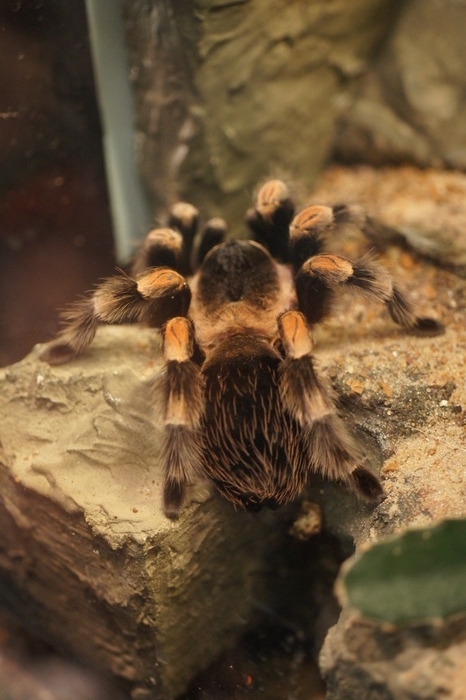 They are one of the more popular pet tarantula species, due to their docile disposition and longevity. The thick hairs on the spider's abdomen are for defense: if frightened they will throw these hairs at their attacker. Nearly all New World tarantulas have this capability, no Old World tarantulas do. 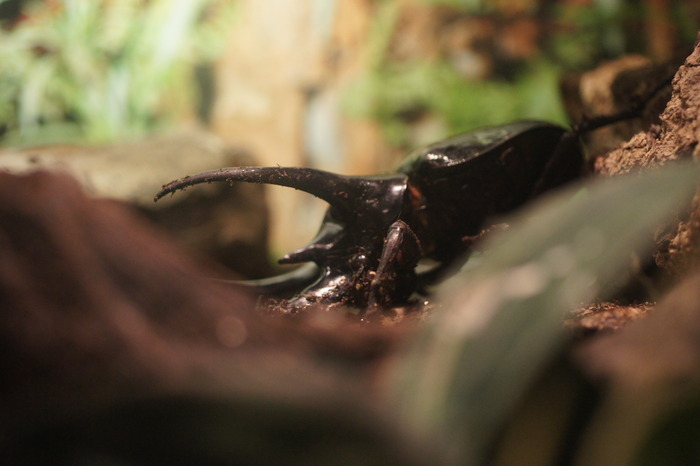 An Atlas beetle, peeking over its rock. You can't really tell from the photo, but this is one massive bug, about six inches from horn tip to tail. It is native to Malaysia, where it is fairly common. I think this is a hairy desert scorpion. Note the little hairs visible on its claws. 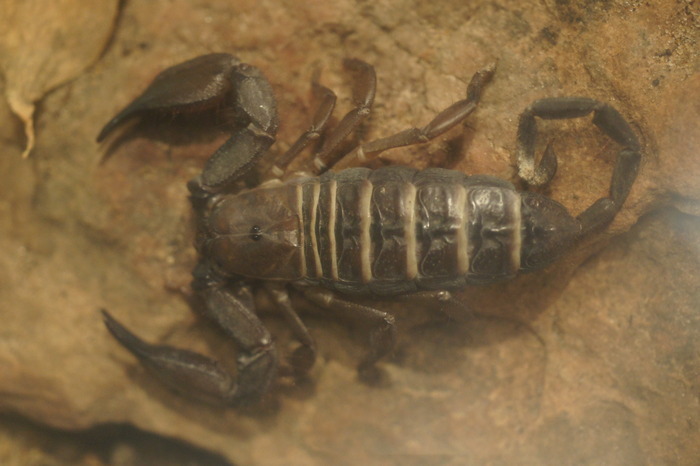 Hairy desert scorpions use these hairs to sense vibrations in the ground. This big spider is best known for its silk. 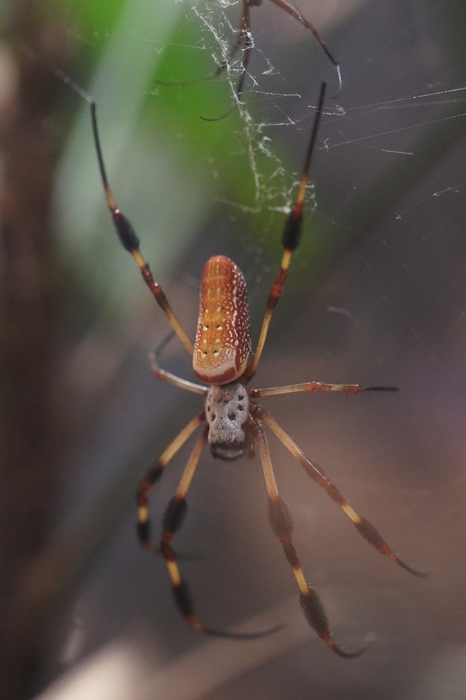 Unlike most spiders, its silk is a brilliant yellow-gold. It is thought that the gold color helps to attract insects into its web, and may help camouflage the web from predators as well. Someone once built a device which could harvest the beautiful silk from many of these spiders at once, but even so thousands of spiders had to be carefully caught and placed into the device and then re-released in order to make a single small cloth. Speak softly, and carry a big stick. That advice would probably work if you happened to be carrying this guy. These walking sticks from New Guinea are about eight inches in length. They are also armed with spines which the locals in New Guinea use as fishing hooks. 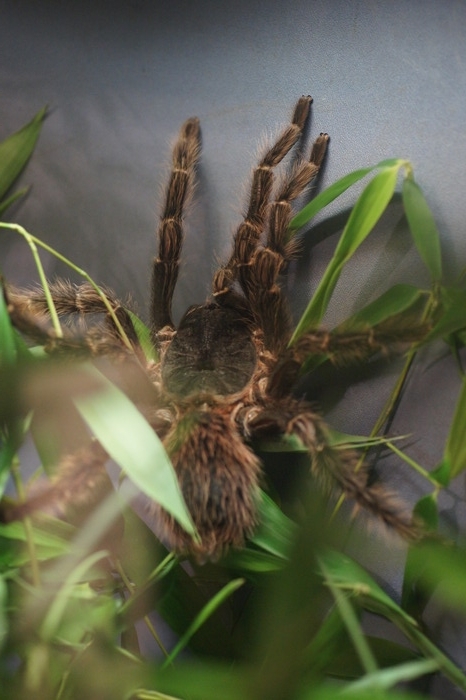 As you might guess from its name, the bird-eating tarantula is big. Apparently it gets its name from some Victorian explorers who witnessed one eating a hummingbird, but this is a rare occurence. 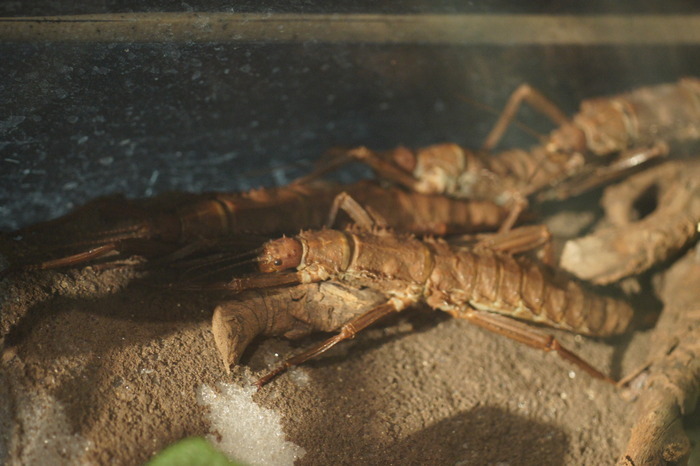 They do commonly eat large insects (in captivity they eat Madagascar hissing cockroaches), small mammals, lizards, etc. This individual was fairly small, with about an 8" leg span. Adult females can reach a 12" leg span and weigh 1/3 of a pound. Giant water bugs are hunters, lying in wait on the bottom of ponds and then striking out at their prey, injecting digestive juices to kill it. Unfortunately for humans, a bare foot on the pond bottom can be mistaken for prey or predator. This photo shows the water bug's gentler side, though. 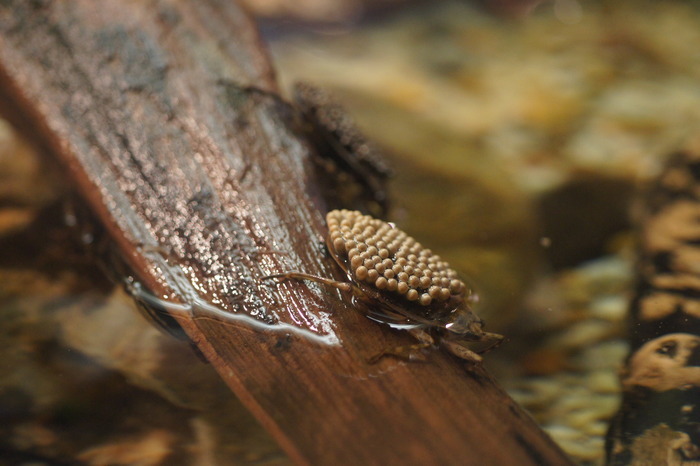 This is a water bug father, tending the eggs attached to his back. The bugs have a complex reproductive behavior, with the female depositing only a few eggs each time she mates with the male. This is thought to help the male ensure that he is the father of the eggs he cares for. The male actively cares for the eggs, agitating the water or raising them to the surface to increase their oxygenation. Meanwhile, the female goes off to search for more mates. Our first sight upon entering the butterfly house was this owl wing, apparently just emerged from its chrystalis. The name comes from the large spots on the wings, which resemble eyes and may help deter predators. 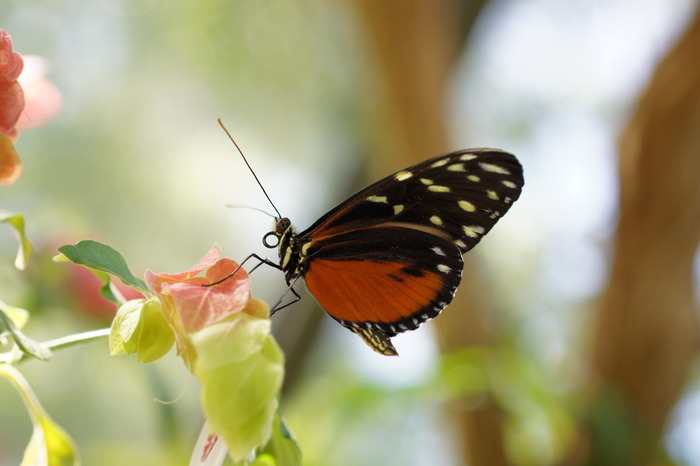 The eye spots may not be good enough to fool a predator, but they probably are enough to startle him for a moment, which is all it will take for the butterfly to get away. 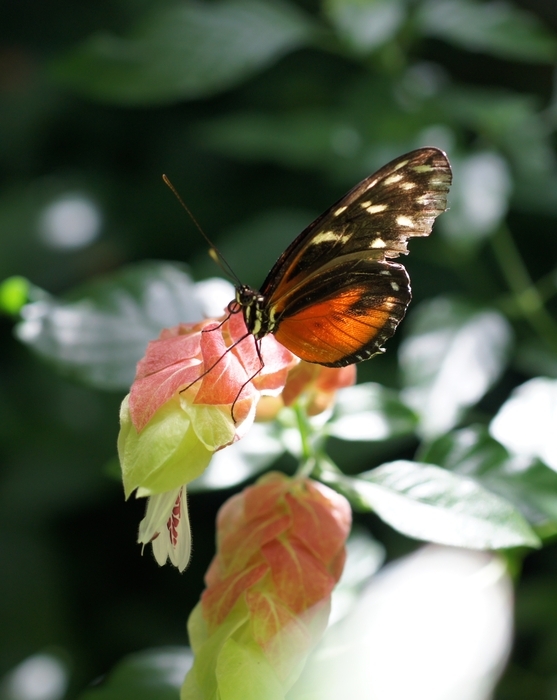 These butterflies mostly stay still during the day, and fly at dusk when there are fewer butterfly-eating birds about. 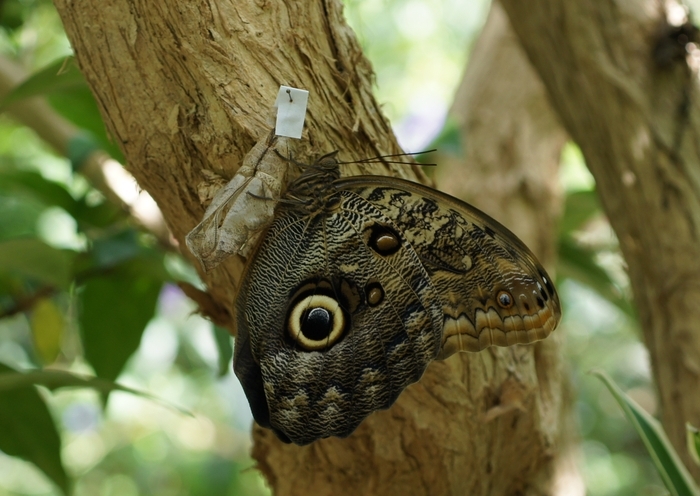 The patterns on the wings certainly help to hide a still butterfly against the bark of a tree. There are about 20 species of owl butterflies; I am not expert enough to say for sure which this is. 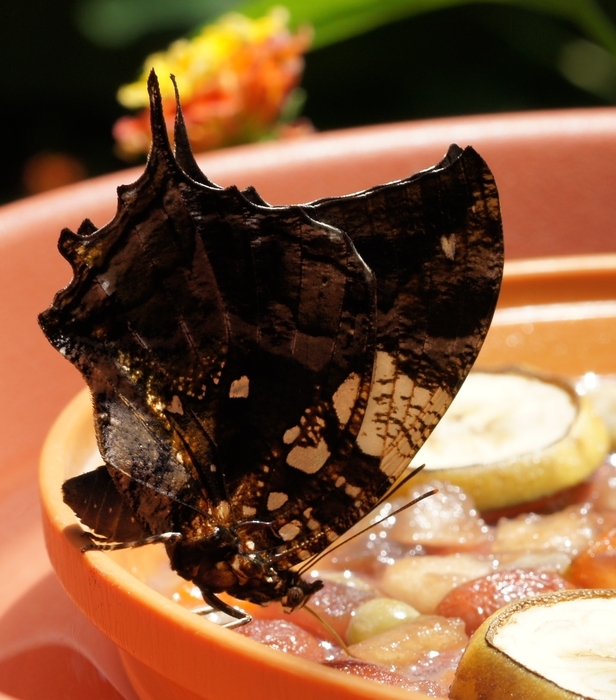 An as-yet-unidentified black butterfly at one of the feeders. A male Catonephele numilia, which goes by the common names Grecian Shoemaker or Blue-frosted Catone. It is native to Central and South American forests. 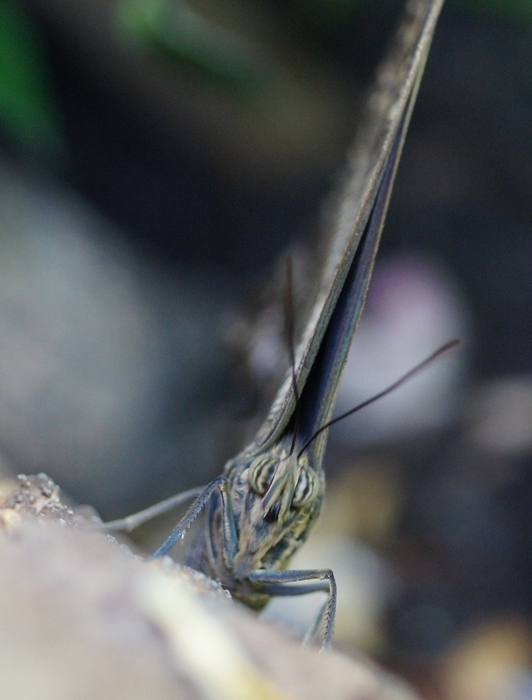 Same butterfly with its wings folded. A different individual Catonephele numilia. Note the two small orange spots just inside the two largest ones - our previous butterfly didn't have them. 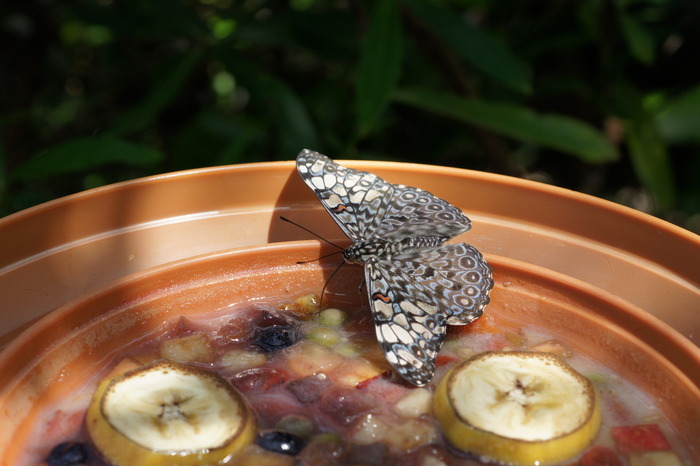 A lovely blue and gray butterfly, which might be in the genus Hamadryas or cracker butterflies. The common name refers to the ability of the males to make a cracking sound with their wings, although no one is quite sure why they do it. 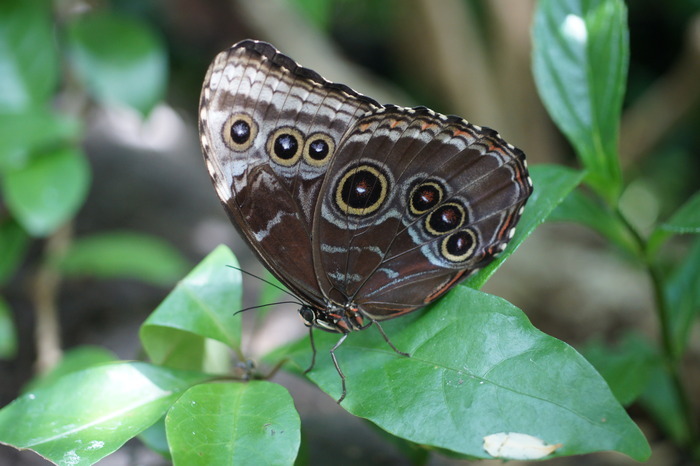 The Blue Morpho is best known for its iridescent blue dorsal wings, but they usually rest with their wings folded. They are quite beautiful from this view, too. There are several species of Morphos, I'm not sure which this is. They are natives of Mexico and South America. This tattered butterfly is probably in the family Heliconiidae, the Longwings. 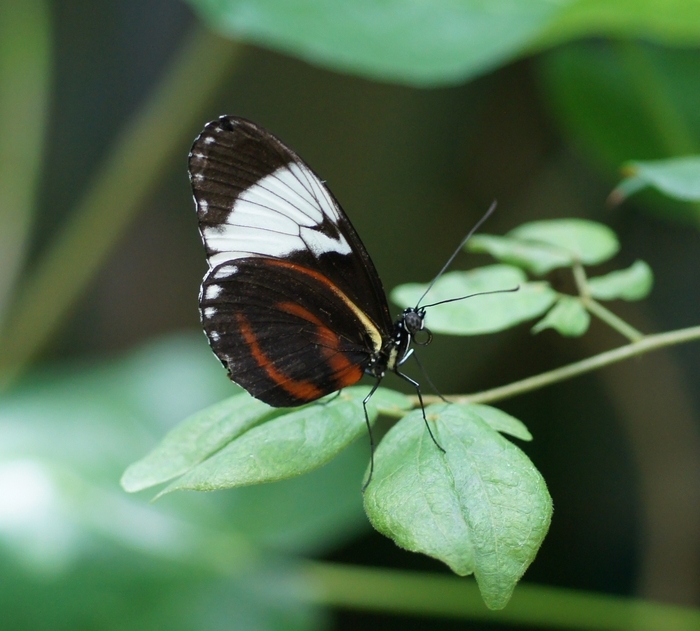 Of that group it looks like a Heliconius cydno, also from Mexico and South America. There are a group of butterflies in this area which may be one species or several. 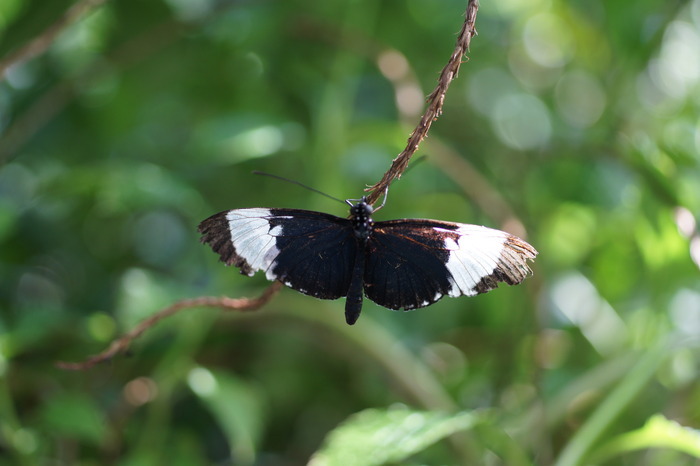 For example, all of the Heliconius cydno-types in one valley will have dusky blue caudal wings, while in the next valley they will all have black caudal wings with a single white stripe. 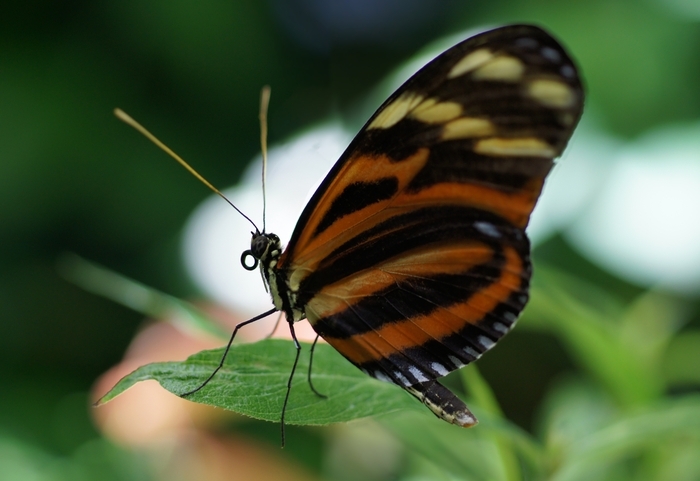 The areas that these butterflies inhabit are sharply divided, and although it appears that they can interbreed, they rarely do. The notion of a species is an artificial distinction, in reality life is much more complicated than that. 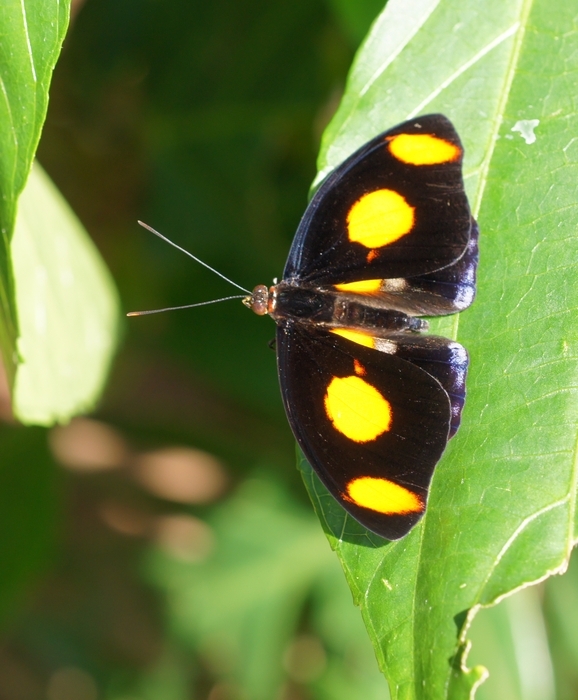 The identifying characteristic of Heliconius cydno is not on the topside but on the underside (ventral) surface of the wings: the reddish-brown bars on the caudal wings. I think this is a Siproeta stelenes or malachite butterfly, named for the mineral of a similar green hue. 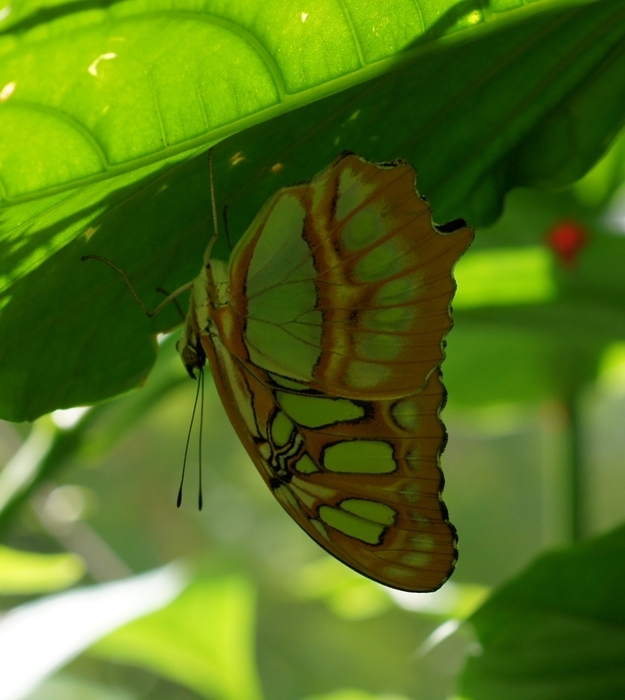 This butterfly is common in Central and the northern parts of South America. They eat nectar, rotting fruit, and dead animals. This one I'm sure is a malachite. Note the different pattern on the caudal (back) wing. A rather ratty Dryadula phaetusa or oak tiger butterfly, native from Mexico to Brazil. 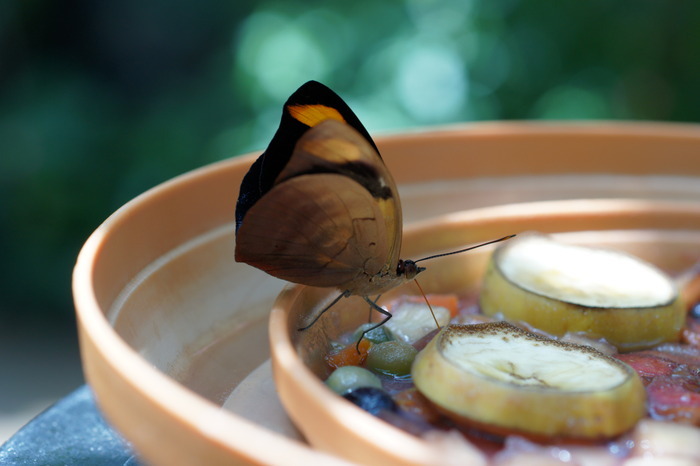 Orange butterflies often have a bitter taste to predators such as birds. Several species, most fameously the Monarch, have converged on orange and black patterns which advertise their unpalatability. This is called M\¨llerian mimicry, where several species mimic each other (presumably, one was the original, but which one that was has been long lost in time). Of course there are other butterflies which are orange and quite tasty to birds, but the number of these must be kept relatively low, or else the birds will learn to ignore the orange and black warning. An eye-to-eye view of Dryadula phaetusa. 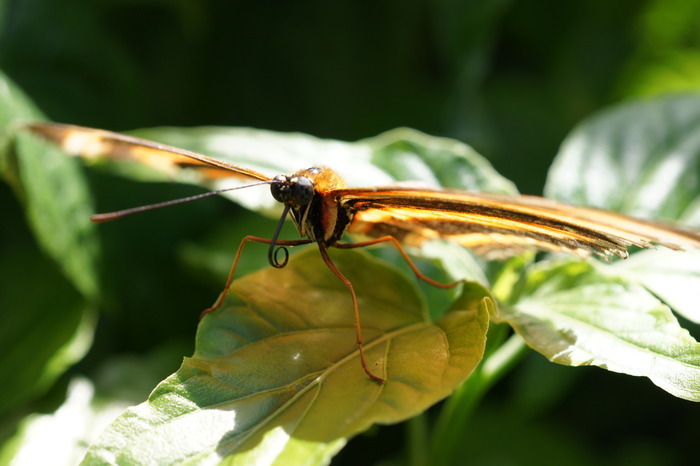 Heliconius hecale, also known as the golden helicon or tiger longwing, found from Mexico to Peru. 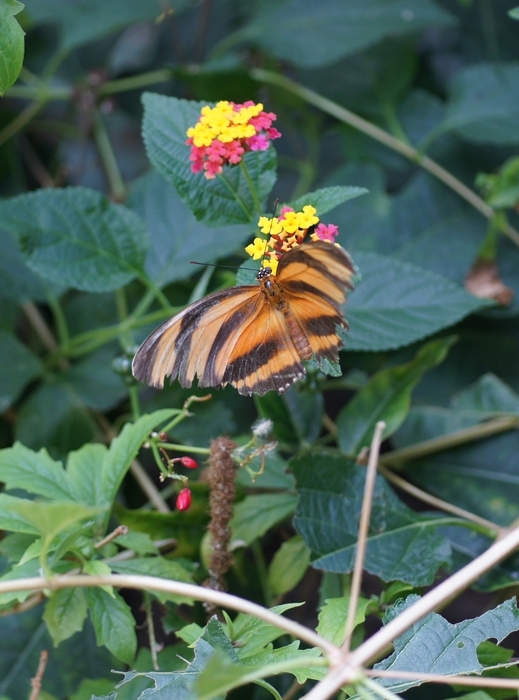 This is another of the bitter-tasting orange butterflies. 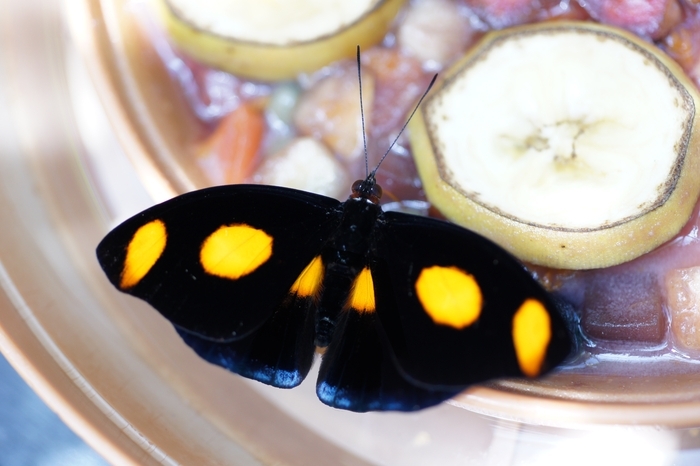 This is probably also a Heliconius hecale, but it could be a look-alike from the genus Lycorea. 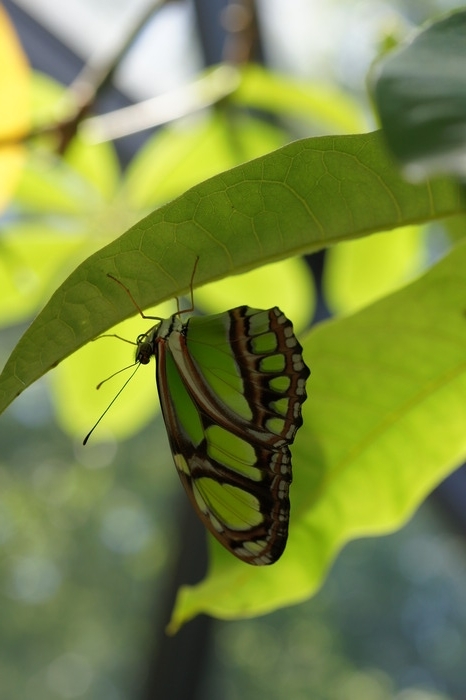 Although these two butterflies are not related, they look very similar - sometimes even getting confused themselves when they are looking for mates. The advantage for both species is that birds quickly learn that these butterflies taste bad. This one is probably a Heliconius sara or Sara Longwing, but it could be a H. leucadia, a species which mimics the more widespread H. sara. 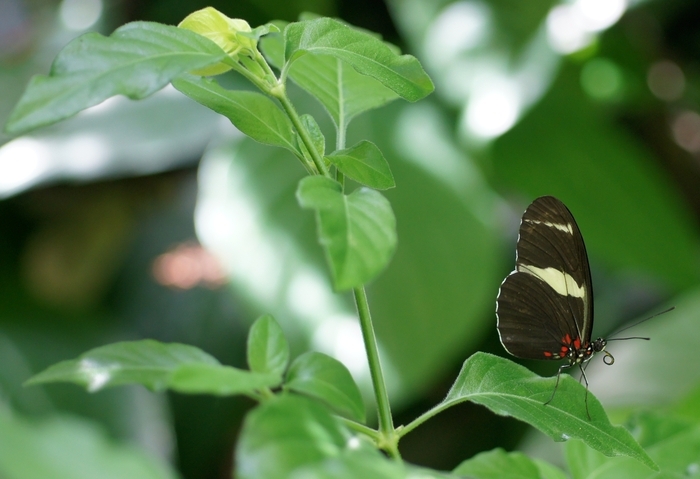 As caterpillars, these butterflies eat passionflower plants. Passionflower plants contain a number of toxins, one or more of which is collected in the caterpillar's tissues and thus rendering it (and the adult butterfly) toxic as well. The butterfly itself is immune to the toxin. 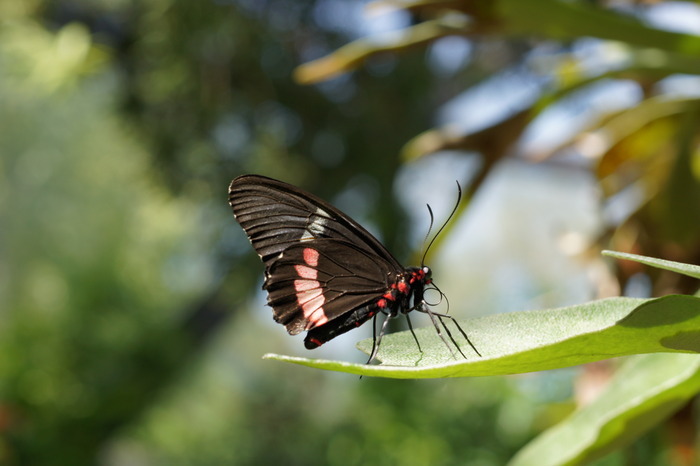 Unknown black and red butterfly. This one appears to be a Lycorea cleobaea, aka the Large Tiger or the Tropical Milkweed butterfly. This one is a relative of the Monarch. Like the Heliconius butterflies, these ingest toxic glycosides from their food as caterpillars (as you might guess, their food consists of milkweed plants) making them distasteful and toxic to predators. The image is actually a two-photo focus stack . There exists software to do this automatically, but I did this one by hand. A blue Morpho by the exit.